This was my fist visit to American Cut Bar & Grill in Englewood Cliffs, one of Chef Marc Forgione’s new outposts in the New York City area. American Cut serves up classic steakhouse fare with a few twists to keep things interesting. Portions are generous and the food is rich, so readers should come with an appetite and expect to hit the gym the day after. We stuck to a handful of tried and true favorites, all of which were delicious. As always, it was great to see old friends and share a few bottles from our cellars. The 1969 Salon is superb, not to mention a terrific way to start the night. Wonderfully fresh and vibrant, especially for a wine of its age, the 1969 possesses striking nuance to match its sculpted personality. A light toasted note adds intrigue throughout. This is easily the best of the three bottles of the 1969 I have tasted over the last few months. Gianfranco Soldera’s 1990 Brunello di Montalcino is bright, perfumed and sensual, with tons of pure raciness. The 1990 Brunello doesn't reach the level of the mythical 1990 Riserva, but, then again, that is a very high bar. Incidentally, the 1990 is the first Brunello Soldera made from his Case Basse vineyard. The 1959 Cheval Blanc is rich, deep and unctuous for a wine of its age, with plenty of sweet fruit to fill out its frame. All things considered, the 1959 has held up beautifully. These two wines from Ridge are exceptional. Along with the Rousseaus, they are my favorite wines of the night. We are fortunate to have a stunning bottle of the 1970 Cabernet Sauvignon, a wine from Ridge’s early days, before this wine was known as Monte Bello. Still remarkably powerful, the 1970 exudes notable depth in its dark fruit and intense ferrous notes. This is a magnificent bottle of the 1970. The 1974 Monte Bello is insanely beautiful, even if it doesn’t quite hit the peaks of the very best examples. 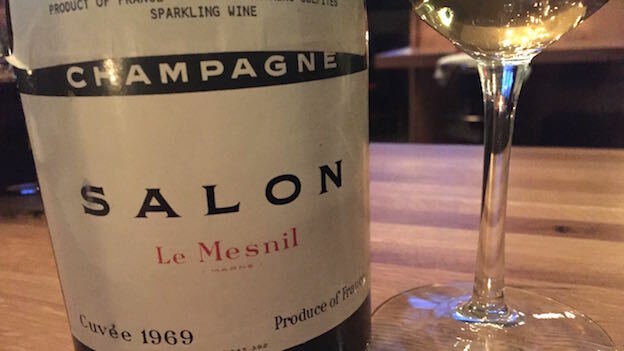 Sweeter and richer through the middle than the 1970 tasted alongside it, the 1974 possesses striking depth and persistence. Dark, unctuous and exotic, the 1974 is hauntingly beautiful. And this bottle is not quite as profound as others I have had! Roederer’s 1995 Roederer Cristal Rosé is a nice break in between all of the reds. A rich, vinous Champagne, the 1995 is totally seamless from start to finish, yet retains remarkable nuance. With time in the glass the 1995 gets better and better. Cristal Rosé may very well be the single most consistently brilliant tête de cuvée rosé Champagne. This is a magnificent bottle. It’s always fun to taste Rousseau’s Chambertin and Chambertin-Clos de Bèze side by side, especially in a vintage like 1993 where both wines soar into the stratosphere. The Chambertin is wonderfully translucent and gracious from the very first taste. Sweet red cherry, rose petal and hard candy add to the wine’s weightless, silky personality. As good as the Chambertin is, I have a slight preference for the Bèze. Deep, powerful and utterly beguiling, the Bèze possesses superb breadth and overall intensity yet remains remarkably vivid. Dark cherry, violet, smoke, lavender and a touch of French oak are some of the many signatures. Rousseau's 1993 Bèze is one of my all-time favorite Burgundies. We are fortunate to have a fabulous bottle. The 1955 Château d’Yquem is not perfect in its aromatics, but it is still quite pleasing. Hints of dried flower, burnt sugar and worn-in leather frame the soft, inviting finish. As good as the wines are on this night, and many are sublime, it is the people and conversation that make a meal truly memorable. This was another fun, relaxing evening with a small group of close friends.